Now for something completely different from Magic YoYo in collaboration with Takuto - a YoYo cro.. The Magic YoYo Magical (M005) is Magic YoYo's first Bi-Metal throw! Inspired by the fanta..
Are you ready for the next instalment in the Skyva line? You will not be disappointed with.. 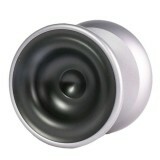 The Magic YoYo N11 features a "Zero in a zone" design, which originated from Chinese designer (a.. The Magic YoYo N12 Shark Honor plays like a $100 yoyo, but you can buy it for a fraction of that.. The Magic YoYo N5 "Desperado" is a super-wide 6061 Aluminium YoYo! This YoYo is super-unresponsi.. The Magic YoYo N6 "Magistrate" is another super-wide 6061 Aluminium YoYo that follows on from th.. The Magic YoYo N8 Dare-To-Do is another very cool yoyo from Magic YoYo. It is a slightly&n.. The Magic YoYo N9 Floating Cloud is a hubstacked, full-aluminium yoyo with a slightly undersized..
Another new competition-ready throw from Magic YoYo is the Node Y01! The Node is a super-.. The new beginner's yoyo from Magic YoYo is the One Third (1/3)! Made from durable plastic.. The Magic YoYo Prophet (M003) is Magic YoYo's latest full-metal YoYo, and it looks superb! With .. The Purple Line is a collaboration effort between iYo and Magic YoYo, and the result is fantasti.. The Magic YoYo Silencer (M001) is the latest offering from Magic YoYo! A great looking YoYo..